I know, I know, I promised two months ago that I would stop taking such long breaks from blogging. Well, life always seems to get in the way. We are currently getting ready to move back to Utah and my studio is buried in mess. So I haven't clayed since - well - since my last tutorial two months ago. However, I was digging around in my files the other day and I came across these pictures I took about 5 years ago of an experimental project I did. I wanted to make a bowl but use the inside of a form instead of the outside. Well, you'll see. 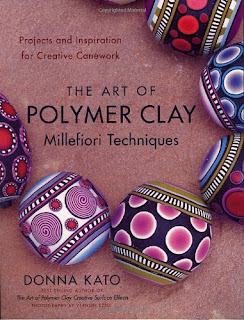 First of all, I had just bought "The Art of Polymer Clay Millefiori Techniques" by Donna Kato and was dying to try out some of the canes in the book. But I wanted to make them into something so I decided to do a coordinating set of canes (for the first time). And here they are. I seem to have a thing for green and purple but I think they turned out rather nice. (If you look close, you can see on the bigger purple and green one where one of my younger kids sliced a chunk off of the cane. I stuck it back together but it never quite lined up right on that end.) I tried to get a mix of simple and more complex canes. Top row: zebra leaf, checkerboard, jellyroll, purple stripe. My bowl was 9 or so inches across and the reason I wanted to use the inside instead of the outside of the bowl was because of the ridges on the outside. I couldn't find a bowl that had an outside that I liked for the inside of my clay bowl. Anyway, I started with 4 slices of the jellyroll cane. All of my slices were about 1/8 inch thick. I squared up one side with the tapered part in the middle and put them together in the middle of the bottom of the bowl. Next I added 4 slices from the larger shapeshift cane. I'm pretty sure I had to remove two of those after I took the picture so I could straighten the outer edge of two of the jellyrolls. After that, I started taking fewer pictures so the changes aren't as gradual. Sometimes it's a pain to stop and take pictures every two or three minutes, especially when I never intended to share them with anyone else. So, the next one shows that I added some slices from the zebra leaf cane (Donna calls it a shapeshift cane in her book - I like my name for it) between the shapeshift canes. I also added some solid green triangles and some slices from the green blend to fill in the circle. I remember struggling some with the next bit. I didn't want to end up with just rows of cane slices but I think making the bottom such a nice circle kind of forced me into it. So you can see where I added slices from both striped canes, the jellyroll and the zigzag canes. Then I filled in gaps with the checkerboard, shapeshift, and half-slices of the bullseye and zebra leaf canes. I also filled in with some solid white rectangles. I'm not sure what I was thinking with the shaping of that top row. I really don't like it now and I'm not sure I liked it then, either, especially since I ended up trimming all of the corners to make a continuous line around the top. For the border, I used back-to-back jellyroll slices and diagonal half-slices of the bullseye and shapeshift canes. It kind of gave the bowl a squarish feel. Anyway, up to this point the bowl really wasn't too bad but I shortly figured out why you want to form shapes like this on the outside of the form instead of the inside. I pressed all of the air bubbles out of the bowl, looking through the glass to see where they were. Then I used my fingers to press out as many of the seams as possible. Not an easy task on that shape. If your clay is on a convex surface (outside of the bowl) you can use your acrylic roller to roll out the seams. You can't do that on a concave (inside of the bowl) surface. Shaving the raised part with a curved tissue blade wouldn't work here, either. Hmm, didn't think of that. I did the best I could with my fingers and decided I'd just sand the thing down after it was baked. Um, yeah. I was fairly new to sanding polymer clay back then and I really had no idea how much sanding it would take. It would have taken a lot. If I had bothered to finish the bowl. I kind of wish I had but it got manhandled (thoroughly) by small children and broken. I still have a few of the pieces around here somewhere. Anyway, I learned another lesson the hard way. Maybe sometime I'll try another bowl and do it on the outside of my form but for now, I'll just chalk it up to experience. Hopefully you can learn something from my experience as well. I love the bowl design, I was looking.observing how you placed the canes (in sequence) and it actually looks like the same way I would place them. I am liking your blog and will be looking at more posts later! Really Love your work. I try to recreate some of your work but never with the same outcome..:( I love polymer clay and make some jewelry etc...you are an inspiration for me...hope you post more videos and tutorials.